The Reading Apprenticeship Project launched its first webinar series this Spring . The theme for this 4-part series is Reading Apprenticeship (RA) and Campus Change Narratives; representatives from each college in this series will share how their RA efforts started and the specific steps they took to grow their Reading Apprenticeship program and reach educators in all disciplines. The first webinar featuring American River College took place last Thursday, May 14. ARC faculty members, Chris Padgett (History Department) and Amanda Corcoran (English Department) shared the professional learning opportunities they have facilitated after completing West Ed’s Reading Apprenticeship Leadership Community of Practice. In collaboration with other departments and committees, ARC has offered several 1-Day Reading Apprenticeship workshops since January 2013 as well as a Course Planning with RA workshop in March 2015; these efforts have reached over 200 faculty, staff and administrators at ARC. 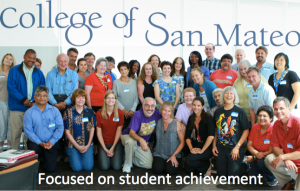 The next webinar is scheduled for Tuesday, May 19 from 4-5 PM featuring College of San Mateo’s Reading Apprenticeship program. To learn more and to register, click on May 19 on the 3CSN calendar.